Athanasios Polychronopoulos is your new WSOP bracelet winner! After four long days of play Athanasios Polychronopoulos claimed his first gold bracelet in his first WSOP final table appearance. Polychronopoulos had to return for a fourth day of action and out last Simon Charette, Peter Ippolito and Yevgeniy Timoshenko in order to take home the $650,223 prize. WSOP heavyweight Matt Stout made the final table but bowed out in 8th place late in Day 3. When the final table reached five-handed play, the chip lead exchanged numerous times with each player becoming the chipleader at one point or another. 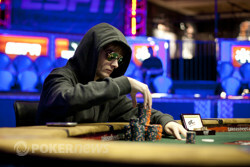 Sebastian Winkler was the last player eliminated in Day 3 after being near the top of the leaderboard on Day 1 and Day 2. Runner up Simon Charette had an up and down day. He went from chipleader to under a million to chipleader within the span of 40 minutes. A few key double ups from Ippolito allowed him to take some momentum into heads up play. But when it got down to Polychronopoulos and Charette, it was all Polychronopoulos. He nearly claimed the bracelet during in a hand where he flopped a set of fours against Charette's . Charette was left with barely two big blinds and the writing was on the wall that this was Polychronopoulos' tournament to win. With another tournament in the books the WSOP Main Event isn't that far off -- only a week away. 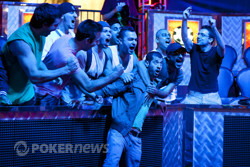 Be sure to follow all the WSOP action live on Pokernews.com. A short stacked and dejected Simon Charette moved all in on the button for just over 1.4 million. Athanasios Polychronopoulos called and tabled and was way ahead of Charette's . The board ran and Charette was eliminated in 2nd place. Simon Charette had half his stack in the big blind and when Athanasios Polychronopoulos raised on the button Charette called. Polychronopoulos held and Charette's tournament life was clinging on . The board ran and Charette doubled to just over 700,000. Simon Charette made it 400,000 to go from the button and Athanasios Polychronopoulos moved all in from the big blind. Charette let out a big sigh and muttered, "Wow, wow, wow." Charette called and tabled and Polychronopoulos held . The board ran and Polychronopoulos took a huge lead with a flopped set. Charette was left with only 395,000 after the hand and Polychronopoulos had almost 10,000,000. Athanasios Polychronopoulos limped from the button and Simon Charette checked his option in the big blind. They went to the first flop of the level after 20 minutes of play. The flop came and they both checked. 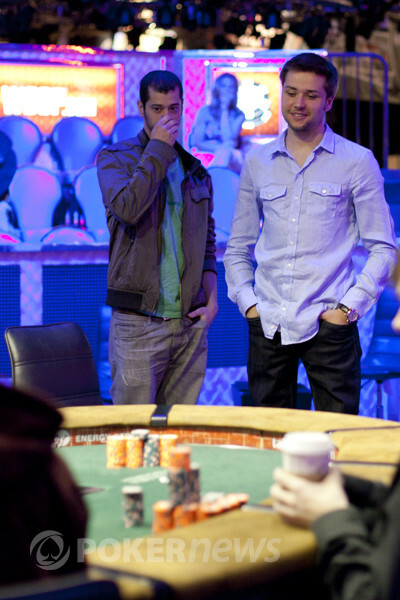 The turn came and Charette bet 285,000 and Polychronopoulos called. The river came and Charette bet 725,000 and Polychronopoulos folded after a few moments. Since returning from the break the two players have yet to see flop. It seems as if they don't want to play post-flop and would rather play two card poker at this point. Cards are back in the air following the 20 minute break.